ConceptDraw MINDMAP with the new Quality MindMap solution is a perfect tool for quality visualizations in your quality team. The features of ConceptDraw MINDMAP preserves total quality management and helps bring out the best in your products and services. 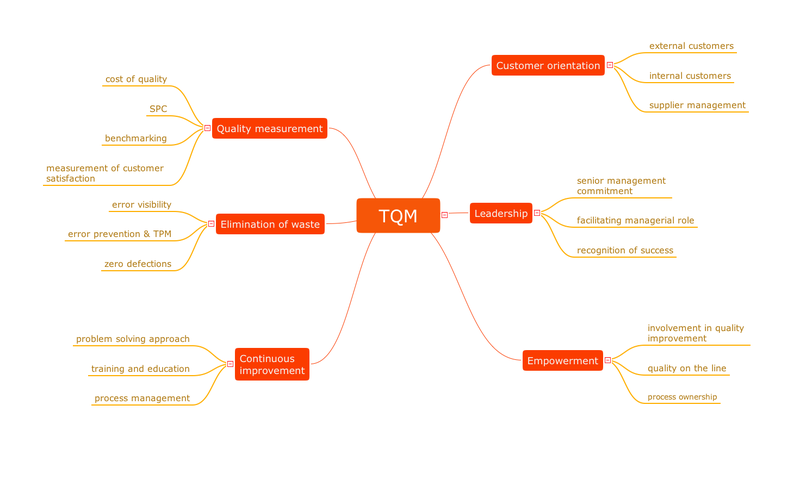 Pic.1 Mindmap - Total Quality Management (TQM). Successful quality management implemented in a company of any size is a critical component of a company’s organization. You can use mind maps for a complete quality process analysis, giving more visibility to the focal points that you need to get clear. ConceptDraw MINDMAP v10 preserves total quality management and helps bring out the best in your products and services. ConceptDraw MINDMAP v10 with Quality mindmaps solution as a demonstration of the creative approach to quality management in daily work of quality management team. ConceptDraw MINDMAP v10 has a addition to the ConceptDraw Solution Park that provides a creative approach to visualizing quality processes, Quality Mind Map Solution.